Jameson has released a specially designed bottle in celebration of St Patrick’s Day. 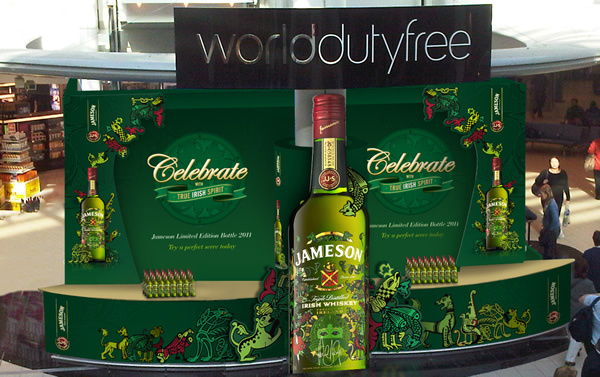 The bottle was designed by Paul Daly and aims to make t Patrick’s Day more contemporary and relevant to global consumers. Over the course of the next few weeks, launches of the newly designed bottle will take place in airports across Europe. The new image fuses elements from Ireland’s past and present, using traditional Celtic imagery which takes inspiration from the Book of Kells. The limited edition bottle aims to “encourage international consumers to engage with the brand. It is strong testament to the strength of our partnership with retailers the extent to which we will activate this product and footprint we will achieve and we take great delight in this,” sayd Pernod Ricard Travel Retail Europe Brand Manager Neil Sharp.